“Hula is the language of the heart, therefore the heartbeat of the Hawaiian people” — King David Kalākaua. 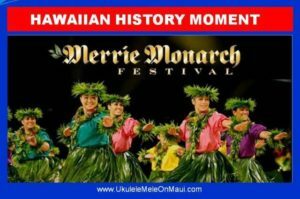 The Annual Merrie Monarch Festival is a week-long event in Hilo, Hawaii, featuring an internationally acclaimed hula competition, invitational Hawaiian arts fair, hula shows, and a grand parade and is dedicated to King David Kalakaua, a patron of the arts. Kalākaua was the seventh and last king of the Hawaiian Nation. He was elected in 1874 and reigned until he died in 1891. During his day, Hawaiian beliefs and traditions were suppressed after many years under Christian missionary teachings. Ancient Hawaiians had no written language and used chants and hula to record such things as genealogy and to pass on stories. Kalākaua was a patron of the arts, especially music and dance, and advocated for a renewed sense in all things Hawaiian. At Kalākaua’s royal coronation in 1883, there were public displays of hula for the first time since the missionaries’ arrival in 1820. In 1886, Kalākaua celebrated his 50th birthday known as the Silver Jubilee with two-weeks of festivities including chant and hula dancers performing in public. Kalākaua was also a supporter of ‘ukulele playing. In 1879, three fine wood craftsmen from Madeira, an island off Portugal, immigrated to Hawai’i and brought with them the braguiha or machete that evolved into what we know today as Hawai’i’s official instrument, the ‘ukulele. ‘Ukulele players can keep Hawaiian music alive by learning Hawaiian songs and stories the Ukulele Mele Way by clicking here. Learn more about the Merrie Monarch Festival held during the week after Easter by visiting their website. 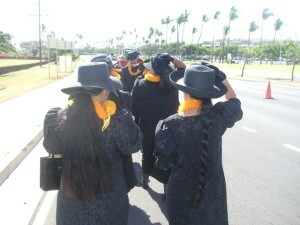 The Hawaiian Serenaders performed at the Richard Hoopi’i Celebration of Life on March 24. 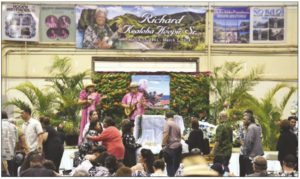 We were surprised to see our picture in the Sunday, March 25 newspaper showing our performance on stage for Hawaiian music legend Richard Hoopi’i’s Celebration of Life held on Saturday, March 24 at the Maui Memorial Gymnasium in Wailuku. We sang “I’ll Remember You” written by Kui Lee and after our performance the MC Alaka’i said it was very appropriate. We were honored just to be able to play and thrilled to have our picture in the newspaper from all the entertainers that performed during the non-stop lineup for 6-hours. Hundreds of people attended to pay respects to the Hoopi’i family. Matt Thayer of The Maui News was the photographer. Richard Hoopi’i was a master falsetto singer and ukulele player known for his voice, big smile, and generous spirit. He died March 3 at home in Kahakuloa, He was 76. In 1996, Richard and his brother Solomon Hoopii were named National Heritage Fellows by the National Endowment for the Humanities. My husband and I were fortunate to see the Hoopi’i brothers receive their award at Lisner Auditorium in Washington D.C. Solomon died in 2006 and we also attended his service in Maui (we moved from Maryland to Maui in 2000). 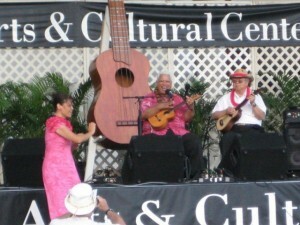 In October 2011, the two Rich’s (my Rich and Uncle Richard Hoopi’i) performed on stage during the Maui Ukulele Festival at the Maui Arts and Cultural Center. What an honor for Rich to back-up Uncle Richard on his ukulele-bass. When Uncle Richard started singing the song Puamana, I couldn’t stand it and jumped up on stage to dance the hula to their music. We have fond memories of playing music and talking story with Uncle Richard and his wife Ululani. When the Hoopi’i’s invited us to their grandson’s 1-year baby luau, we felt privileged to be included as part of their ohana (family). KEEP HAWAIIAN MUSIC ALIVE – Click here. “This is my favorite class.” “More people should come to your program.” Hearing these comments from my students brings a smile and sense of accomplishment of achieving my goal of sharing the joy of making music one ‘ukulele players at-a-time. 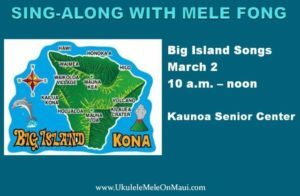 Eighteen people signed up for my Sing-Along with Mele Fong Series – Big Island Songs on Thursday, March 2 from 10:00 a.m. – noon at Kaunoa Senior Center for adults age 55 and better. In the second year, the program evokes the feeling of sing-along with Mitch Miller programs from long ago. I used PowerPoint to project the lyrics and chords for 8 songs up on the screen so everyone could see. The presentation of 47 slides (approximately 4 lines per slide) took 1 hour and 10 minutes. As I introduced each song, I told the story behind it in keeping with Hawaiian oral traditions whether the song was Hawaiian or not. For songs in the Hawaiian language, I taught how to pronounce the lyrics and the translation. We all had fun singing while I played my ‘ukulele and my husband accompanied the group on his u-bass. Kupa Landing – by Lot Keawe, 1890s. Akaka Falls – by Helen Lindsey Parker. Kuhio Bay – by Keliana Bishaw. The Beauty of Mauna Kea – by Keola Beamer, 1976. Hilo March – by Joseph Ae’a, 1890s. My Little Grass Shack – by Johnny Noble, Tommy Harrison, Bill Cogswell. 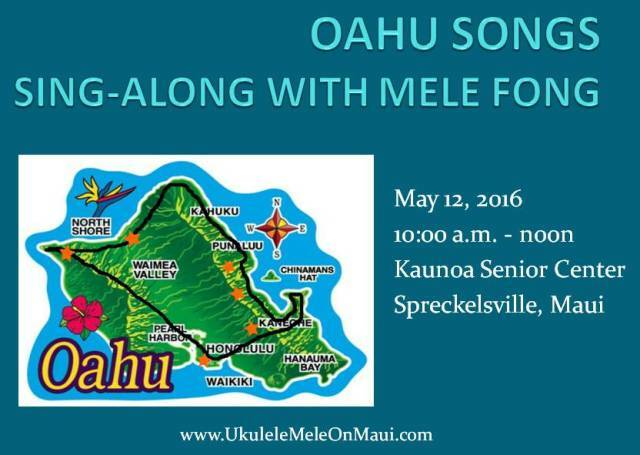 Stay tuned for the next Sing-Along with Mele Fong Series – Kauai Songs coming on Thursday, April 26. Learn more about classes offered at Kaunoa Senior Center for 2017. In Hawai’i we say Hau’oli Makahiki Hou to say Happy New Year. “In ancient Hawaii, the Makahiki Season was a celebration of abundance of land and sea and the accomplishments of the Hawaiian People. It was the time for healing, new growth, a time of peace and spiritual cleansing of the Hawaiian mind, sound and heart, in celebration of life.” The season lasted approximately four months between November and February. In the spirit of the Makahiki Season, I offer you a Hawaiian cultural connection through the perpetuation of playing Hawaiian music on the ‘ukulele. Live the Hawaiian culture from wherever you live. 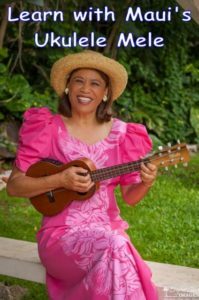 Learn to play the ‘ukulele, Hawai’i’s official instrument, from a Native Hawaiian with over 50 years of ‘ukulele playing and performing experience. For all of you homesick Hawaiians and Hawaiians-at-heart living away from Hawai’i, learn the old Hawaiian songs in a new way. Get my song arrangements with unique strums for the ‘ukulele. Can’t pronounce the Hawaiian words? No need to. Forgot the melody? We sing so you can focus on playing along. Curious about the story behind the song? Watch the video story and/or read the song sheets. 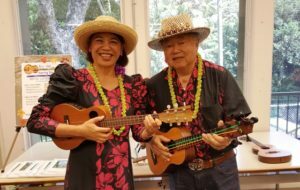 Celebrate the Makahiki Season with Ukulele Mele! Learn to play Hawai’i Aloha via a new Single Song Purchase. Subscribe to Complete Online Lessons aka Advanced Online to learn 32+ Hawaiian songs. 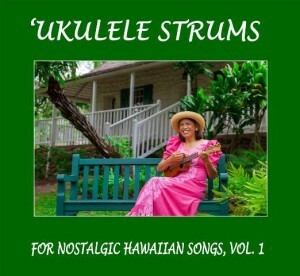 Purchase Nostalgic Hawaiian Songs Vol. 1 packaged set of book/DVD/CD. Purchase Nostalgic Hawaiian Songs Vol. 2 packaged set of book/DVD/CD. Visit the Fan Club to hear Hawaiian songs you can learn to play via private webcam lessons. Read more how Ka’anapali Beach Hotel celebrates the Makahiki season. We have attended Hawaiian cultural events at the hotel and appreciate the local feel of the place. “I would like to take this opportunity to thank you for a wonderful experience in your Hawaiian Songs 1 class. I did not expect to learn as many useful techniques for playing ukulele Hawaiian style, plus learning some very challenging strums. The selection of traditional Hawaiian songs was great, and your presentation was excellent. Perhaps the best part of the class is that it was fun. I am looking forward to the Hawaiian Songs 2 class. Mahalo nui loa.” —-Kip Bowley (standing far right), Maui, 27 August, 2016. “Thanks for allowing me into your Hawaiian songs class. I mainly signed up for this class in hopes of improving my performance of Hawaiian songs and especially trying to improve my Olapa strumming technique. This class has helped me with the pronunciation of the Hawaiian language in son and the different strums. All the information about the background of the songs has been so educational for me. I look forward to more classes in the future. Thanks again!! Mahalo.” —Charles Calvan (sitting far right), Maui, 27 August, 2016. 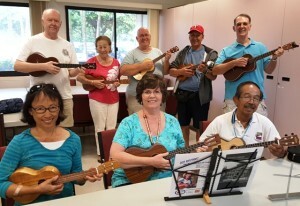 I received the above written comments about my Hawaiian Songs for ‘Ukulele One class that met on four Mondays for 2-hours each day at Kaunoa Senior Center for adults 55 and better. We used my newly revised ‘Ukulele Strums for Nostalgic Hawaiian Songs Volume One packaged set with book/DVD/CD for the curriculum. Eleven students signed up, with half being brand new students. All but one student is continuing into the next class, which I feel is a great testament. 1. Aloha ‘Oe with Morse Code Strum. 2. Hula O Makee with ‘Olapa Strum. 3. Ku’uipo I Ka He’e Pu’e One with Pick in 4 and Latin Strums. 4. Makalapua with I Wanna Rest Strum. 5. On The Beach At Waikiki with Hum Ding-Ah Strum. 6. Sanoe with Waltz Strum: Thumb Strum Up and Pick in 6 Strum. If you want to learn Hawaiian songs from wherever you live, purchase the packaged set online for Nostalgic Hawaiian Songs Volume One and I will mail it to you. The next Hawaiian songs for ‘ukulele class starts Monday, August 29 and uses the newly revised ‘Ukulele Strums for Nostalgic Hawaiian Songs Volume Two packaged set with book/DVD/CD for the curriculum. Purchase the set of Nostalgic Hawaiian Songs Volume Two, and I will mail it to you. Saturday, June 11 is Kamehameha Day, the birthday of Hawai’i’s First King, and one of two state holidays honoring Hawaiian ali’i (royalty). I will be marching along with my Ahahui Ka’ahumanu sisters in the commemorative march organized by the Royal Order of Kamehameha. We are usually joined by members of the two other royal societies and friends as we march down Ka’ahumanu Avenue to Hoaloha Park to honor King Kamehameha’s memory on his actual birthday. This is not a parade with floats. In the top photo, here is the scene in front of me as we marched down the street. In the bottom photo, my Uncle Clifford Hashimoto as Ali’i Ai Moku, meaning the head of the statewide Royal Order of Kamehameha, gets ready to welcome participants at the end of the march. In turn, each head of the four royal societies says something during the ceremonies before we adjourn for lunch. 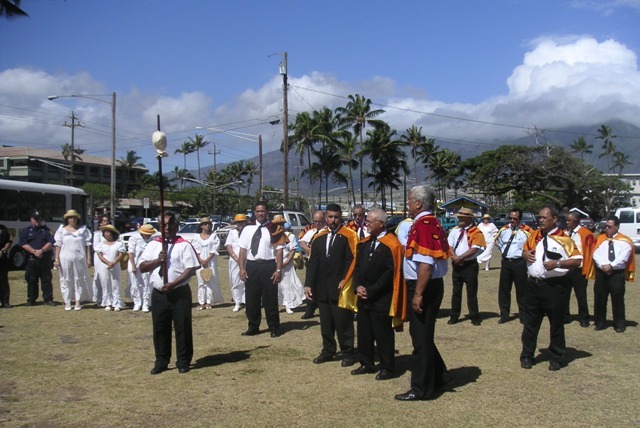 The first time I participated in the march was in 2005, after being initiated into the Ahahui Ka’ahumanu Chapter IV Wailuku in September 2004. Members are Native Hawaiian women who are sponsored into the organization that honors Queen Ka’ahumanu’s memory as favorite wife of Kamehameha and more. I am proud of my Hawaiian heritage. As past historian for the Ahahui, I used to give short 5-minute historical talks at membership meetings and at public events. I have since expanded those talks to 2-hour PowerPoint presentations that I present to the public to keep our Hawaiian stories and traditional music alive. On January 11, I gave a presentation on Hawai’i’s First King as the first program in my Hawaiian History Series for 2016 at Kaunoa Senior Center for adults 55 and better. We learned about Kamehameha who lived from 1758-1810, and sang 4 songs relating to him and the time period. Read more about the program. Last year, I did an Oral History and Sing-Along Program on June 11, King Kamehameha’s actual birthday and state holiday, at the Bailey House Museum in Wailuku. 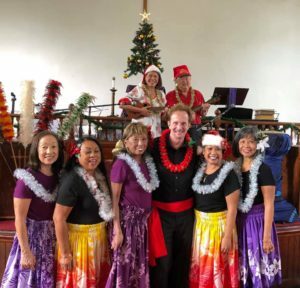 The 2-hour program included a short lecture about the King and the singing of 9 traditional Hawaiian songs and the stories behind them in keeping with Hawaiian cultural traditions. Read more about the program. One of the songs related to Kamehameha that ‘ukulele players can learn is Na Ali’i, a song written in 1928 by Samuel Kuahiwi in praise of the chiefs and includes two of their famous sayings. Subscribers to Complete Monthly Online Lessons can learn to play the song with my Hum Ding-Ah Strum, download the PDF song sheets, view the video lesson, play along with the audio recording, and watch the video story in the lesson along with 49 other lessons for 30 days at-a-time. Listen to an audio sample of Na Ali’i and learn more about subscribing to Complete Monthly Online Lessons to learn to play more Hawaiian songs. “Today was challenging, but fun. The lady next to me said she had taken your ‘ukulele class in the past. I noticed she was playing an imaginary ‘ukulele and told her she should bring her ‘ukulele next time. She gave me a big smile. Maybe she will…” – email from student Lee Shigezawa. 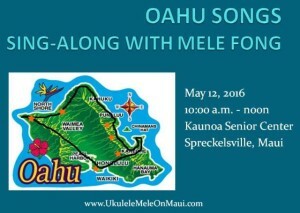 Fourteen people signed up for my NEW Island Sing-Along Series on Thursday, May 12 from 10:00 a.m. – noon at Kaunoa Senior Center for adults age 55 and better. The fourth program of the series was about the Hawaiian island of Oahu. I used PowerPoint to project the lyrics and chords for 8 songs up on the screen so everyone could see. The presentation of 57 slides took 1 hour and 25 minutes. As I introduced each song, I told the story behind it in keeping with Hawaiian oral traditions whether the song was Hawaiian or not. For songs in the Hawaiian language, I taught how to pronounce the lyrics and the translation. We all had fun singing while I played my ‘ukulele and my husband accompanied the group on his u-bass. About a third of the audience brought their instruments and played along. ‘O Ka Leo – by Richard Iliwa’alani. Henehene Kou ‘Aka – traditional. On the Beach at Waikīkī – by Henry Kailimai and G.H. Stover, 1915. Kaimana Hila – by Charles E. King, 1916. Royal Hawaiian Hotel – by Mary Pula’a Robins, 1927. Honolulu I’m Coming Back Again – by F.B. Silverwood and David Lindeman, 1919. Beautiful Ilima – by Princess Emma Alexandria Kanoa DeFries. New this time I used the laser pointer feature on the remote control to advance the PowerPoint slides. It sure came in handy to show people where we going on the map of Oahu, and to show the line of the song we were on as we learned to pronounce the Hawaiian words. Another first was my new method of showing the Hawaiian song lyrics on the screen while telling the translation and the source, and pointing out familiar words to help people get the just of the story. This was better than my previous method of telling the translation of the song while people looked at the cover image for the song’s title. After the program, someone asked, “Do you have handouts?” My response – no, take lessons. 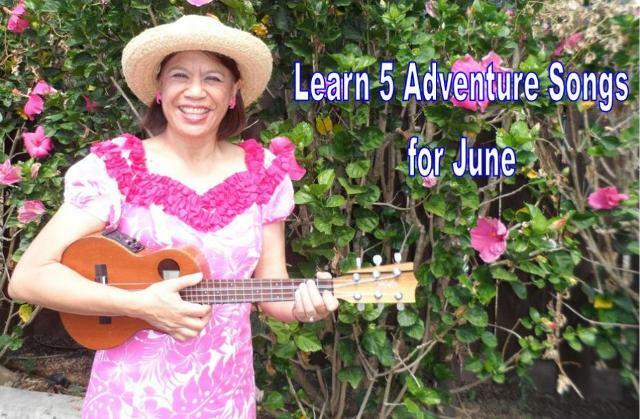 Stay tuned for the next Sing-Along program coming on June 16 about Hapa Haole songs. Visit my online Event Calendar for more info.